Clarion is widely recognized as a premier training ground for aspiring writers of fantasy and science fiction short stories. 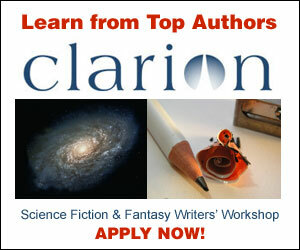 Since its inception in 1968, Clarion has been known as the “boot camp” for writers of speculative fiction. Each year 18-20 students, ranging in age from late teens to those in mid-career, are selected from applicants who have the potential for highly successful writing careers. Students are expected to write several new short stories during the six-week workshop, and to give and receive constructive criticism. Instructors and students reside together in campus apartments throughout the intensive six-week program. 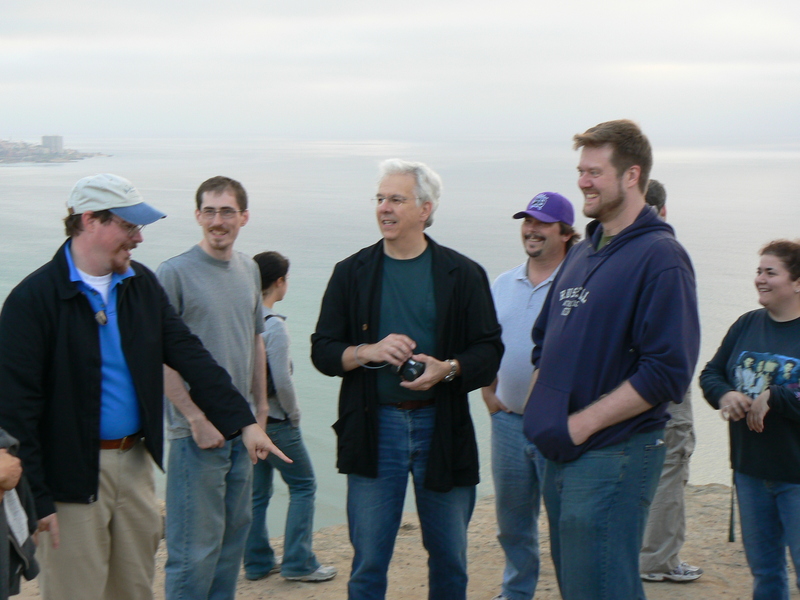 The application period for the 2011 workshop is December 1 – March 1. Applicants must submit two short stories with their application. Scholarships are available. Additional information can be found at http://clarion.ucsd.edu. See my Page on CLARION 2011 for more info on what a Clarion can do for you. Personally, I have to say that the chance to work with Kij Johnson would be enough to make me put on a disguise and go again, though, like Narnia, former Clarion grads can’t go home again…. Kij’s story, “26 Monkeys, Also the Abyss” won the World Fantasy award and was on the final ballot for both the Nebula and the Hugo. It’s an AMAZING story and just the kind of story I hope to write when I grow up. One alley from sidewalk to sidewalk. He’d been doing this for 43 days in a row when he ran into me. Follow the link, get stunned by his work. All Yukoners, all beautiful pictures, wonderful, fun people. They are our stories. But my story got me to thinking about being a writer of genre. Morgan tells me to come into his shop, Photovision, and when I get there he cuts a piece of cardboard from a box, slaps down two markers and says, Draw. What do I draw? He’s made a speech bubble. “Whatever you want to.” I have NO idea what to put there. He wants the first things I think of. I hem and haw a bit. Suddenly, I just sketch out a design and draw Mr. Spock with a latte from Baked Cafe there. We shoot the photo in the alley. And then, it’s over, so I think. And I’m halfway back to my truck and I think–“You fool! You could have said something important about the value of words. That words can be healing, or words can be explosive and destructive. And what did you do? You did something frivolous. And stupid–and highly derivative. Are you just a Trekkie? Is that all you are?” These were the voices in my head. So I ran back to Morgan, grabbed him by the shirt collar. “We have to do it again!” I said. Okay, maybe I didn’t grab his shirt collar, but I was insistent that we do it again because I’ve thought of something more important to “say.” So he patiently carves out another speech bubble for me, and I draw out the symbol for Medicine (you know, the two snakes wrapped around the staff with wings–started by Moses, so long ago)–cause I’m going for “Healing Words”…. So, we go out into the alley so I can get shot again. And we’re both thinking the same thing, and we’re talking…maybe we’re overanalyzing, we both say. And we take the shots. And they are highly thought out… and they say the “right thing.” But they seem orchestrated, forced. I think, later, that THIS is the argument that every writer has with him/herself. Especially writers of any genre: humor, science fiction, romance, fantasy, western, children’s, young adult, gay, hairy monster, etc. We think that we must say something IMPORTANT with what we write. That we have to use our considerable talent, and all writers have “considerable talent” with words, and say something like “WORLD PEACE, IDIOTS!” or “Stop oppressing us! !” or “Global Warming is REAL!” or “Whales don’t deserve to be SHOT!” And who can argue with these messages? Certainly they are important. We all know that. And certainly other people will consider you a much weightier writer, a writer with HEFT, if you can tackle Global Warming, or Teen Pregnancy, or something important, in your writing. They often give awards in that direction (and they do it in film too….). But who’s to say that the person who laughs at my first photograph won’t be healed? Who’s to say that you can’t heal someone with words without broadcasting that you are HEALING them? Who wants to be hit over the head with a message? And why can’t REALLY good genre do everything that you need it to do–be a damn good story, with a subtle message and a lot of entertainment? I think, as writers, we all balance between these two photos: the need to say something important, and the need to say something fun and frivolous. And we see them as two different categories. That we can’t be fun and important. We see this in many other areas too (religion, politics, leadership), but for me it resonates as the battle I fight every day: What value, I think, is Fantasy writing? How does it help the world? Shouldn’t I turn my skills to Environmental Literature? No. You should only do that if you are called to do that. If you try to write Environmental Literature and you were born to write Children’s Books about Rockets and Squid–then you will be a very frustrated Environmental Literary Writer. Where is your passion? If you find your passion, I think you get the package deal. You will affect people in important ways by being yourself. There is no real dichotomy between writings—there is only being true and not being true to yourself. The truth is–we need comedy, romance, westerns, mysteries, radio dramas, children’s picture books with gorillas in them–we need to laugh to fight the absurdity, we need to feel hope in the face of injustice, and we need to fantasize about escape. We need it All. Write your part of the All. 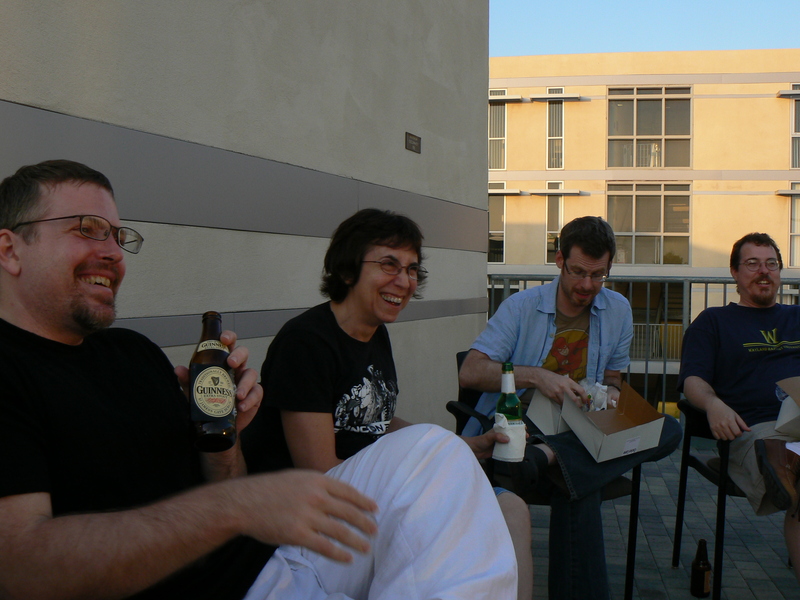 If you want to write science fiction and fantasy there is no better crucible and proving ground, classroom and community, than Clarion San Diego. I have already written a whole page on it, and updated the writers for 2010. It looks to be awesome. You have about six weeks to turn in applications to go. If you want a career in writing science fiction and fantasy, this is the right investment. After this, you don’t have to invest in another writer’s workshop for more… this is all you need. The writers are some you know and some you might not yet: Samuel R. Delany, George R.R. Martin, Ann and Jeff VanderMeer, Delia Sherman and Dale Bailey. The opportunities you get to move your work around and let people see it are great. Go to their website here. 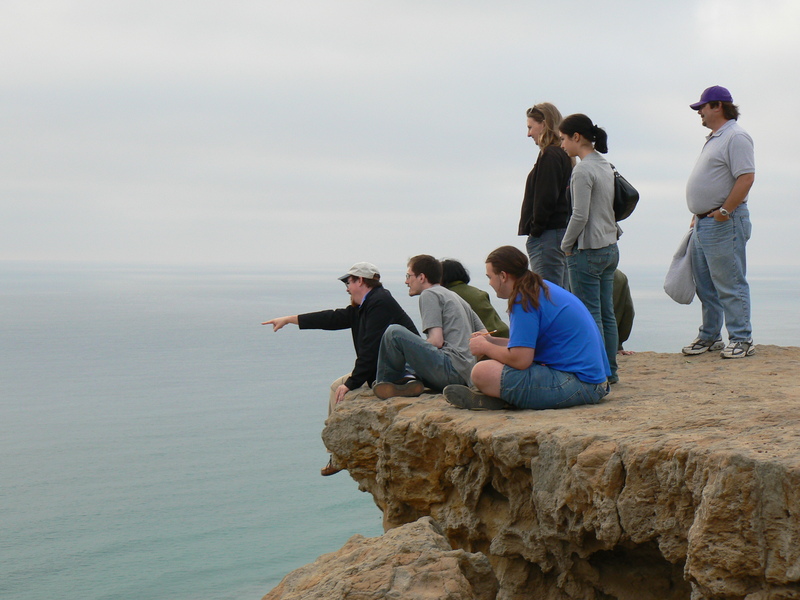 That’s us in the picture, on the bluffs outside La Jolla, near San Diego. That’s me pointing to the future. I say, “Hey, look, I can see a whole group of published writers!” And then someone says, “Out to sea, huh?” Okay, we didn’t say that. But these people became some of my closest friends. I seem to be doing more pointing. I do that a lot. People just stare at me like I’m one of those people. Clarion solidified my “calling”–not only because everyone sacrificed to get there, but because we were taken seriously. I wrote a lot and wrote intensely. I was challenged. Wow, was I challenged. And I experienced some great moments of my life. I would love to relive this again–and really relish it this time. You get so busy writing you sometimes forget. If you think it’s too much, it will be. But I took a third of everything I had and put into this workshop financially, and I wasn’t the only one. I love where it brought me, and where it let me stay for six weeks, and where it’s carrying me in the future. I think you will too. There are a lot of workshops–Odyssey, Clarion West, etc—but I think this one is the best. And if you respect the 18 other students there, you will get the most out of the workshop. If you feel defensive about your work before you go, you might not get as much out of the workshop. Because certainly the work will be up for critique–but not you. You are up for amazing moments and good, solid career information. Go. You’ll be glad you did. It’s official: Realms of Fantasy is back, and expecting a ton of submissions. I don’t think we should disappoint them. Note, Canadian authors: though you still have to submit hardcopy, if you supply your email, they will answer you via email. They don’t want to work with IRCs and who does? So, this saves us time too. Realms of Fantasy, a bimonthly magazine, is a professional market for the best in fantastic short fiction. Stories should be no longer than 10,000 words, and can address any area in the realms of fantasy: heroic, contemporary, traditional, feminist, dark, light, and the ever-popular “unclassifiable.” What we do not want to see is standard SF (this means no alien worlds, no hard-edged technology, no FTL drives, etc.) Additionally, ROF is not a market for poetry. What we do want to see is the very best in the field–Realms of Fantasy is a highly competitive market. For stories under 7,500 words, rates begin at 6 cents per word for new writers and move upward as a writer gains recognition. For stories over 7,500 words, the rates break at 7,500 to 4 cents a word. Thus, a 10,000-word story by a newcomer would pay $550. Again, for established writers, the rates will be proportionally higher. All submissions must be typed in a 12 pt. serif font such as Courier or Times Roman, double-spaced, and accompanied by a self-addressed stamped envelope large enough to hold your manuscript. Manuscripts not typed and double-spaced will not be considered. Manuscripts without return postage will not be returned. If you wish us to discard the ms. and reply only by letter, you need only enclose a letter-size (#10) envelope and mark your ms. DISPOSABLE. Your name, address, email address and phone number should appear on the first page of the text, not on a cover sheet, as cover sheets can easily get separated from the rest of the ms.
International authors must still submit hardcopies of their stories but we will respond via email rather than regular mail, assuming that you do not require your ms. to be returned to you. We do not accept multiple or simultaneous submissions. Response time is ordinarily 8 to 12 weeks. We regret that the majority of our responses must be in the form of pretyped letters. This in no way reflects on your work, only on our time and work load. Thank you for your interest in Realms of Fantasy, and we look forward to seeing your work in our pages. Now, go give them what they want! Good Yukon Stories, or stories from Yukon authors. For some of you Nanowrimo was a great experience–but what next?? Or some of you have an old novel kicking around in your closet. Dust it off, get it ready. I’m teaching two courses at Yukon College in the Winter, both of them are Fiction Writing Workshops. You can read more about them if you click on Writing Classes up on the Menu Bar. In brief: Monday night is for novels that are more realistic–they don’t have magic, or time travel, or science fiction, or monsters in them. They are set in this world, working with people as we know them. They can be set in the past. If you have at least 3/4 of a novel manuscript through a first draft, you are welcome to join the course. If you don’t have that much done, that’s okay to join too, as long as you know that a majority of people will be working on novels, and that class time discussion will be focussed on longer story arcs. People with novels are required to workshop 3 chapters over the course of the semester, comment on other people’s chapters, and with a group, present one novel to the class, one of the ones that we will be reading (we have three on the schedule), and turning in to the class a synopsis of your novel. The practical side is that in April you will need one synopsis and the first three chapters of your novel ready to show editors who are coming to the Yukon!! Don’t pass up this opportunity. BIG name people are coming to look for manuscripts and help people move towards publication. They will take our class to the next level, much farther than most could take you. They will also take you to that next level if you AREN’T a part of the class–the Editor’s Weekend is a Yukon Wide event… (oh, it won’t be named Editor’s Weekend…I just made that up….). Tuesday nights are for those novelists with a speculative element in their novel. There are different considerations when you are working with speculative elements and you will want people who are familiar with those elements. The rest of the class will be VERY similar to the Monday night group–all that’s different is that we will be working with texts that are outside of realism, even just slightly. The courses are 16 weeks long, are the cheapest prices in any college in North America (dare anyone to beat $150 per course), and I think you will get more bang for your buck. Workshops are good to use to get a good opinion of what to look at more closely. Only come if you are ready to receive the opinions of 15 other readers, and to consider their thoughts on your work. Come and Join us for a good workshop experience! CRWR 241: Fiction Writing Workshop (Mondays–realism; Tuesdays–Speculative) Starts Jan 5 at Yukon College!